In The Passing of Weary Souls (pictured above), 1921, a pair of black boots, set in stride, dominate the image. The boots are animated, but no person wears them. As though anyone might be walking in those shoes across the landscape, this painting is about a journey. Emerging from the storage of the collection of Berea College to the walls of the Kentucky Museum of Art and Craft, C.C. 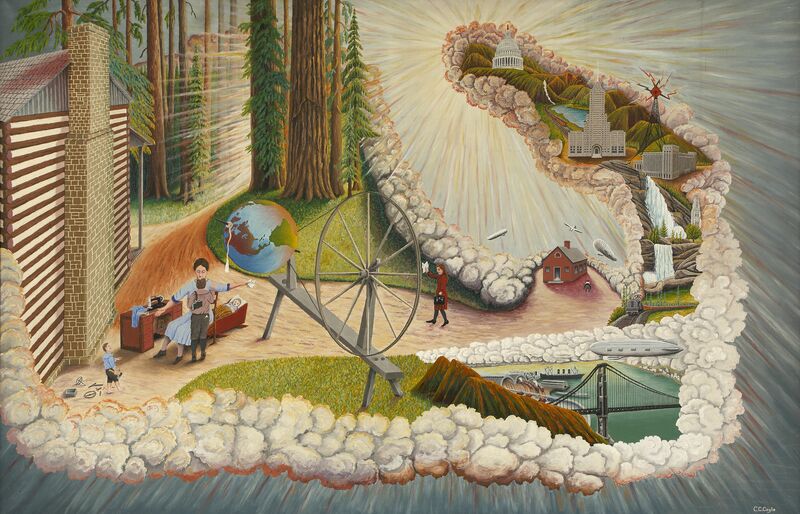 Coyle’s paintings are a moral journey through American life as told by a self-taught Kentucky country man. The falls of Yosemite appear again in the grand painting entitled The Hand that Rocks the Cradle Rules the World, 1935. This painting best illustrates Coyle’s sense of narrative as parable. Like a moral story, the painting is an illustration of the American dream and the value of motherhood. Coyle provides a rich description of this painting in his diary, stating, “I am giving this picture to the public believing that every great man or woman had for their background the training of a good mother. It has been said that many of our great men owe their crown of glory to a good wife. That takes us right back to the mother again. This wife got her training from a good mother. Of course we must make some allowance for a fertile brain; even a fertile brain can be ruined if it does not get the proper training and support.” Thus, the good mother rests near a cabin, representing a schoolhouse, surrounded by her four children at various stages of need and independence. It is clear that her good deeds lead great men to the innovations of technology and the pages of history contained on the right side of the canvas, from aircrafts and railroads, to memorials and the White House. A sweeping epic of generations, the story unravels across the canvas, floating on dream-like clouds. C.C. Coyle, The Hand That Rocks the Cradle Rules the World, 1935. In all of these paintings, and in the words of Coyle’s diary, there is an earnesty to his call for moral fortitude and the American spirit. Although Coyle might be considered a folk artist because he was not traditionally trained, his deliberately planned, studied, carefully executed and sophisticated painting style reveals a body of work that is far more complex and cohesive than might be imagined for a naïve artist. While some research has been done on the biography and interpretation of his works, there is great potential to reveal a rich tapestry of American life. -Eileen Yanoviak has been selected by KMAC as the incoming University of Louisville Hite Art Institute Fellow for 2013-2014. The life story of Carlos Cortez Coyle is so similar to the many Americans that lived during the Great Depression that it’s hardly newsworthy. His stories of financial and emotional trauma during this time are not what make him unique. But what does separate Coyle and arouses public attention are his 24 paintings that are on exhibit at KMAC. This is just a small sampling of his 82 piece collection stored at Berea College in eastern Kentucky. Compositions consisting of Kentucky and California landscapes, humorous morality tales, mystical visions and most importantly a visual diary of a man concerned with leaving a lasting heritage. This special research exhibition is presented in order to lay the groundwork of including him among the names of Modern self-taught artists and to begin answering the question of Who Is C.C. Coyle? Coyle spent the early part of his life in Dreyfus, Kentucky and in 1889 he briefly attended Berea Foundation School (now Berea College) where he was introduced to Appalachian arts and crafts. Some of his early drawings of birds, plumes, feathers and goddesses can be found in an old school diary that Berea College now possesses. Coyle left Berea before graduating for reasons unknown and moved to Florida, then Canada and eventually to San Francisco where in 1929, at the age of 60, Coyle took up oil painting and completed over a hundred works in just thirteen years. In 1942, prompted by his failing health, Coyle paid to ship four crates from San Francisco to Berea College in Kentucky containing 47 paintings, 35 drawings and an illustrative diary of his work. He wrote a letter to the college explaining his shipment of works and the intention “to give my art to the land of my birth where I played and spent most of my youth.” Berea staff were unsure as to what to do with this unexpected collection and the works were left crated and put into storage where they remained with the occasional piece being pulled from time to time until 1960 when art professor Thomas Fern discovered the collection and held Coyle’s first solo exhibition. The exhibit received some local public recognition from the Louisville Courier Journal’s art editor William Mootz who wrote that Coyle “may some day rank as an important American primitive.” Berea Art Department staff found Coyle who at 88 was suffering from blindness and residing in Leesburg, FL. He wrote a letter of thanks to the school for showing his work in the gallery. Carlos Cortez Coyle died two years later in 1962. He was 90. The Kentucky Museum of Art and Craft presents the work of C.C. Coyle to be viewed in the larger context of exceptional naïve artists and to recognize his place in Kentucky’s art history.